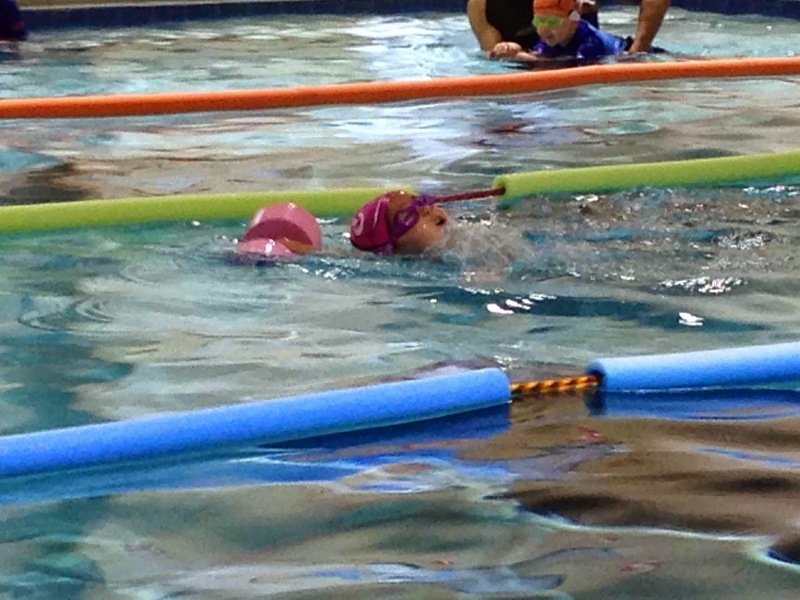 Wordless Wednesday- Swim, Fishy, Swim! 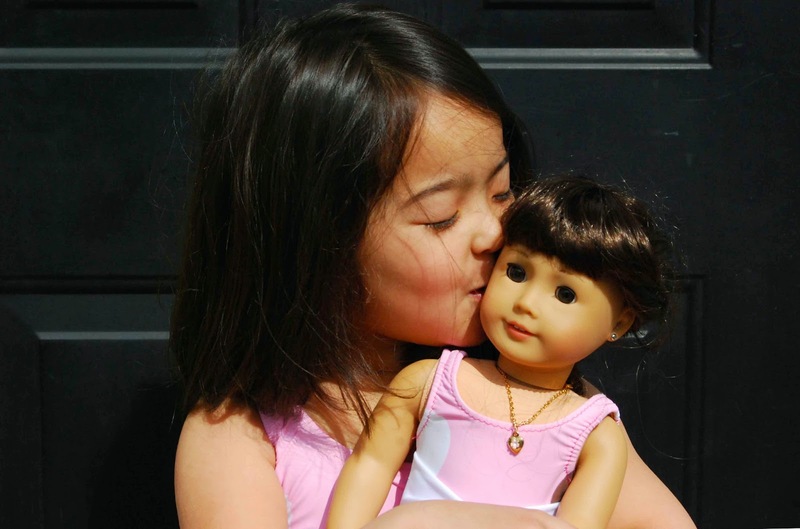 Wordless Wednesday- Kisses for Samantha! Hello, lovely readers and guests from Little Kiwi's Closet! 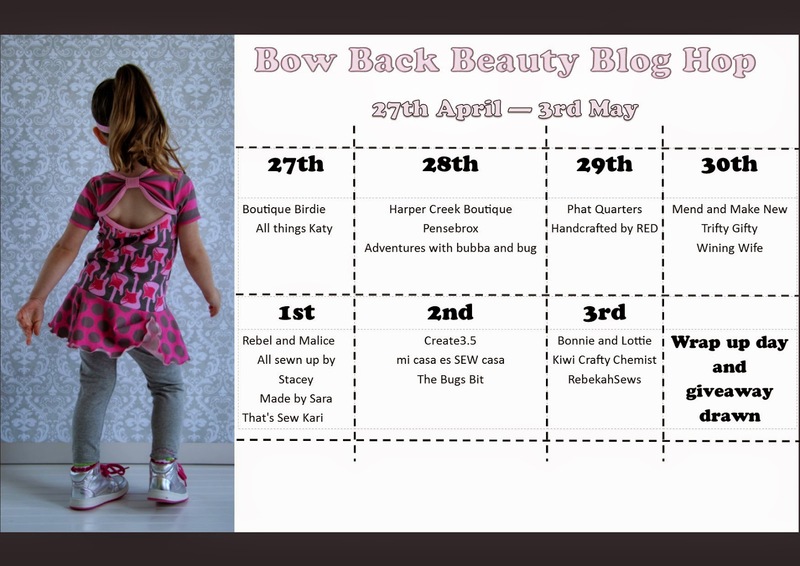 I'm really excited to be starting off the Bow Back Beauty blog tour with you, today!! I was really, really excited to be asked to sew up this little beauty from a new-to-me designer, Little Kiwi's Closet. -The Bow Back Beauty comes in sizes NB to 12 years. -There are two different bodice styles- waist and hip. -There are two different back options- Bow and plain. -There are four sleeve options- sleeveless, short, short with cuff and long. 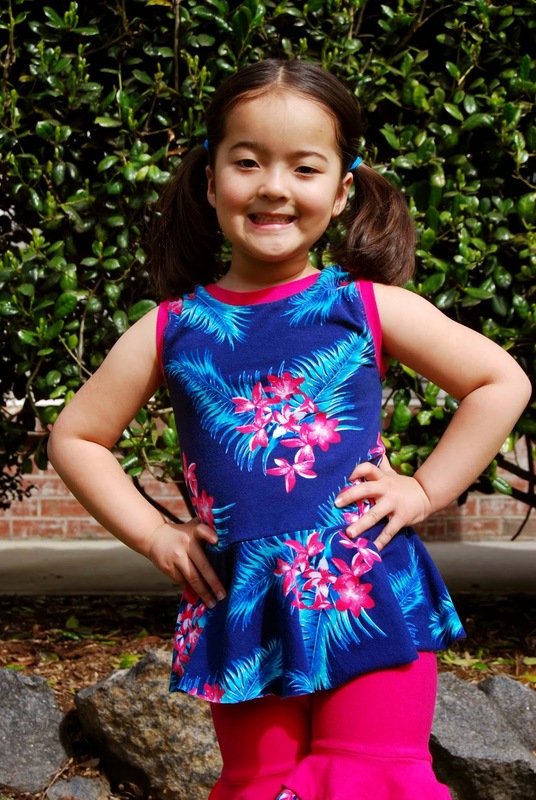 -There are six different skirt options- peplum with skirt (at waist or hip), dress below knees, dress with hi-lo skirt, double peplum and skirt+peplum. 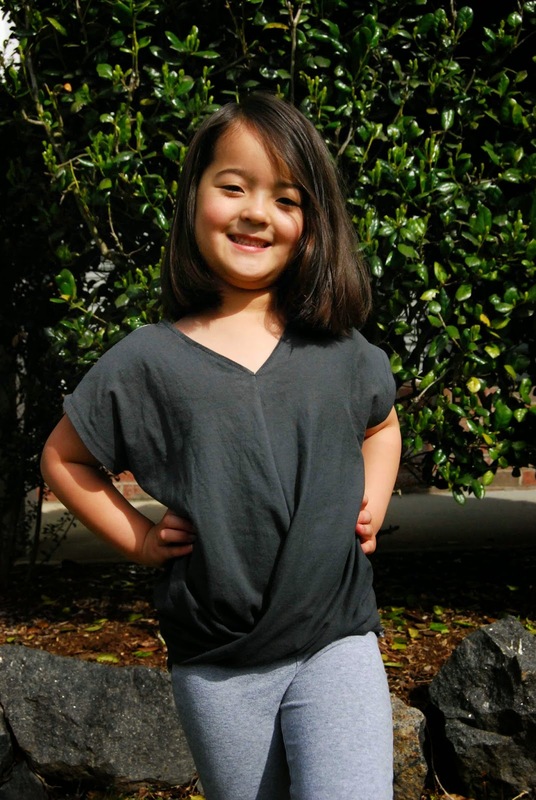 -Instructions to sew a onesie with snaps are also included in the pattern. While the weather here in NC has been a bit mercurial, lately (one day it's 90 degrees, the next it's 60 degrees), summer is fast approaching. So, I thought it would be fun to sew a cute, comfy outfit that is perfect for the hot, humid dog days of summer- sleeveless and shorts it is! The Bow Back Beauty pattern has a great fit and I felt that it ran true-to-size. The waist sits right where it should and the peplum is enough of a "skirt" for my girly-girl to run, play and still have fun! The instructions for the Bow Back Beauty are really well-written. I would rate this pattern a very confident beginner/intermediate pattern. Since the whole thing is done in knit fabric, you really have to be comfortable sewing with the stretchy material and using a serger to get the best end result. There is a lot of "set-up" in the pattern- ie, instructions on how to cut out a circle skirt, layout, etc. However, this is all very valuable information. So, I would suggest going ahead and reading it all in detail to make sure your dress is a success! Once you get the main part of the pattern, though, it goes by pretty quickly and efficiently. 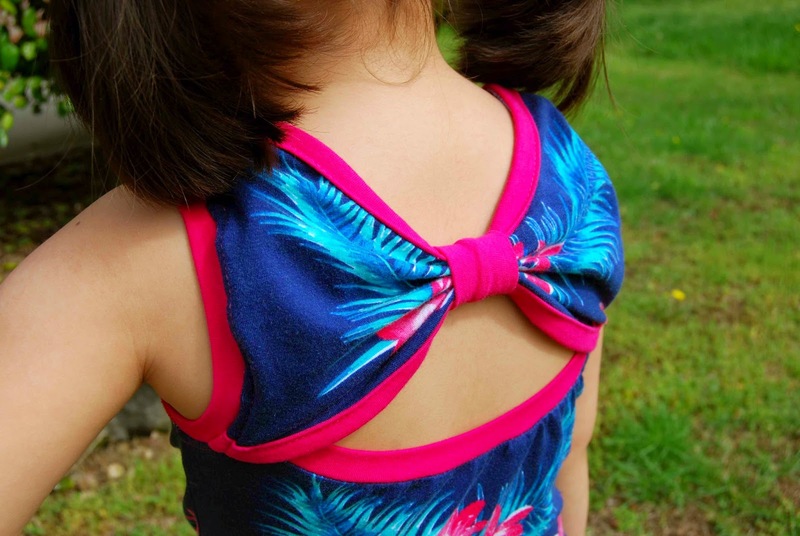 There are lots of pictures and diagrams included in the Bow Back Beauty pattern. While the pictures are very helpful, I do wish that they were slightly bigger in size. I'm a visual learner, so I like to study the pictures to make sure I'm doing things correctly. I love that the Bow Back Beauty pattern includes instructions for multiple ways to do the same thing. Case in point- the bindings. Personally, I like to cut a piece of cotton lycra and do a band, stretched to fit the opening. However, the instructions also include how to do a folded over type binding (refer to the pattern, for more details). I used my preferred binding for the neck and arm openings. I used the Bow Back Beauty instructions for a folded over binding for the bow binding. I like to change things up a bit and try new techniques. There are lots of options for this pattern. The Bow Back Beauty could definitely be a year-round pattern- long sleeves for the winter and short/sleeveless for the summer. With the large size range, the Bow Back Beauty will not only last you year-round, but it will also last for years to come! Now, let's talk about the back. Specifically, the bow....! 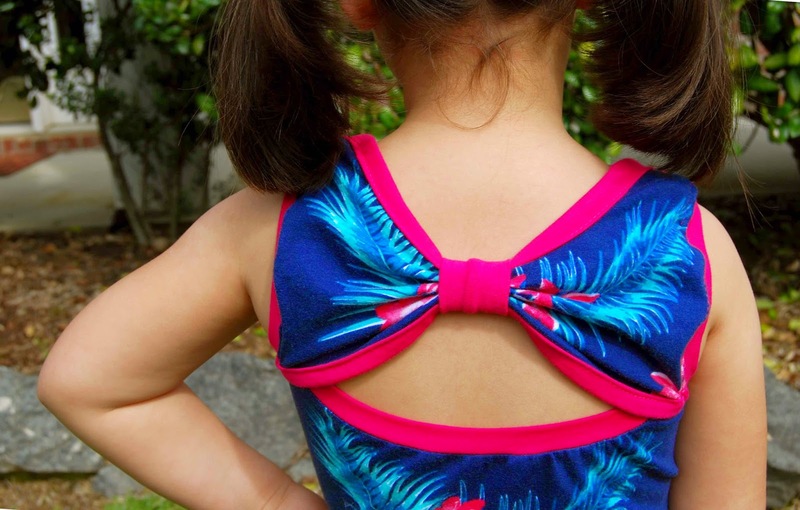 Look at that gorgeous bow back detail! I love it! It's sweet and feminine while totally being playful and fun (and easy to move and groove in)! Seriously, the back has it on the Bow Back Beauty!! Love it! Best of all, so does Lil' Miss! I definitely see more of the Little Kiwi's Closet Bow Back Beauty in our future!! Thank you, Lydia, for allowing me to be apart of your blog tour! I had sew much fun!! **All knit material came from the wonderful Purpleseamstress Fabrics. Mel is helpful, knowledgeable and speedy in her deliveries. I couldn't ask for more better customer service! 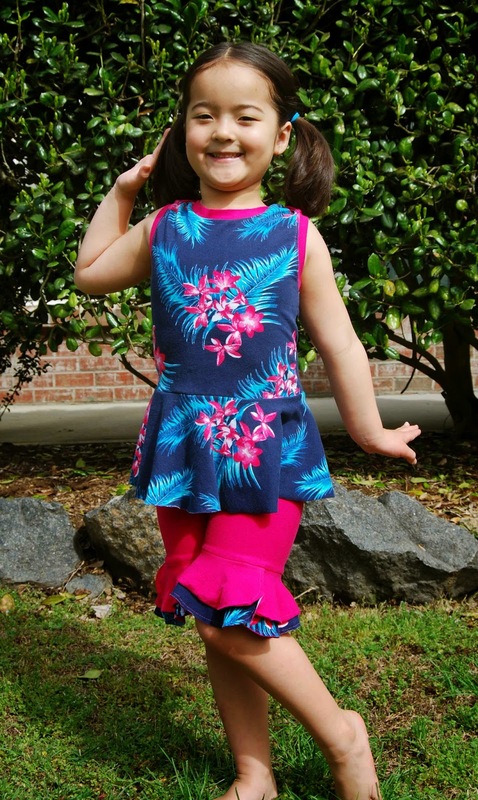 ***The shorts shown with the Bow Back Beauty are the LilyGiggle Petunia Petal Pants pdf sewing pattern in short length. The Petunia Petal Pants are my go-to leggings pattern and one of the very first successful things I sewed in knit. A Decade! 10 years- that's how long Ted and I have been married! Excuse me for a moment while I get a little nostalgic...It seems simultaneously long and short (in a good way, of course!). There are moments where I think, "10 years- Wow! That's a long time!" 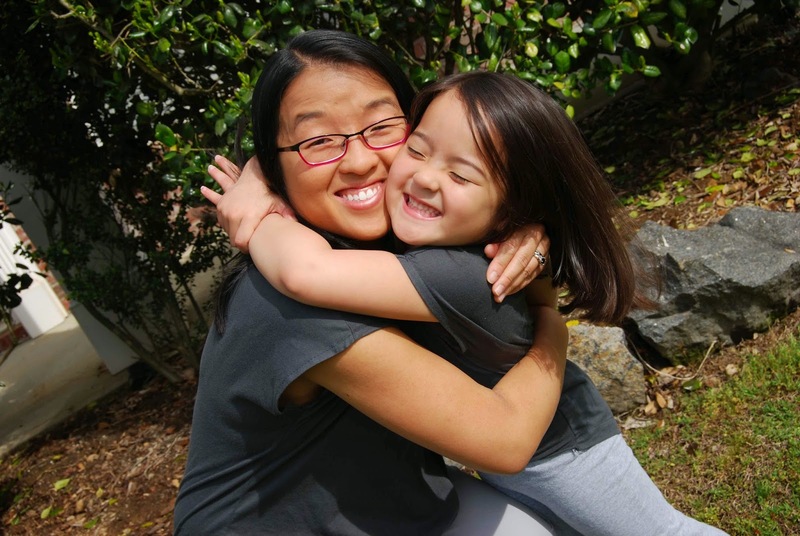 Then, there are moments where I think, "10 years- they just flew by in a blink of an eye!" There's a sense of accomplishment that comes with hitting the double digits milestone. In some ways, I feel like we've "arrived." As in, we've had enough life experiences together to truly understand how to make our marriage work. We're hardly marriage or love experts, but we are definitely in this forever. Our life, now- as opposed to 10 years ago- looks a lot different than it did back then....We've had ups- the birth of our beautiful daughter, Katy! We've had downs- the whole condo debacle! There has been a lot of laughter and a lot of tears along the way. We've changed states and cities. We've changed jobs- and in my case, jobless by choice. We've moved, we've traveled, we've cruised and we've enjoyed our little family. I wouldn't change any of it for the world... 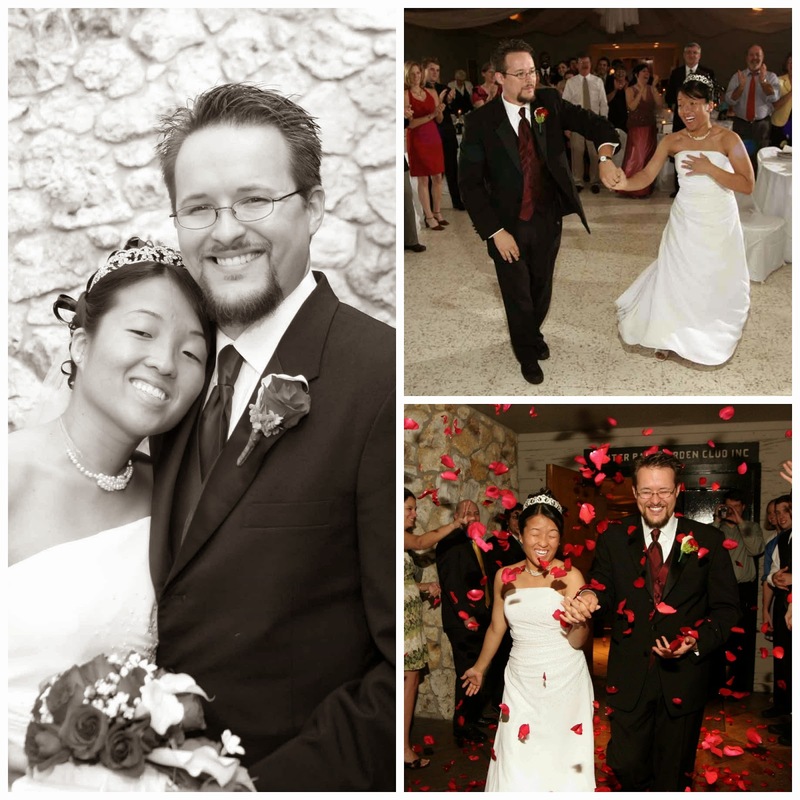 Happy 10th Wedding Anniversary to us! I can't wait to celebrate many, many more!! 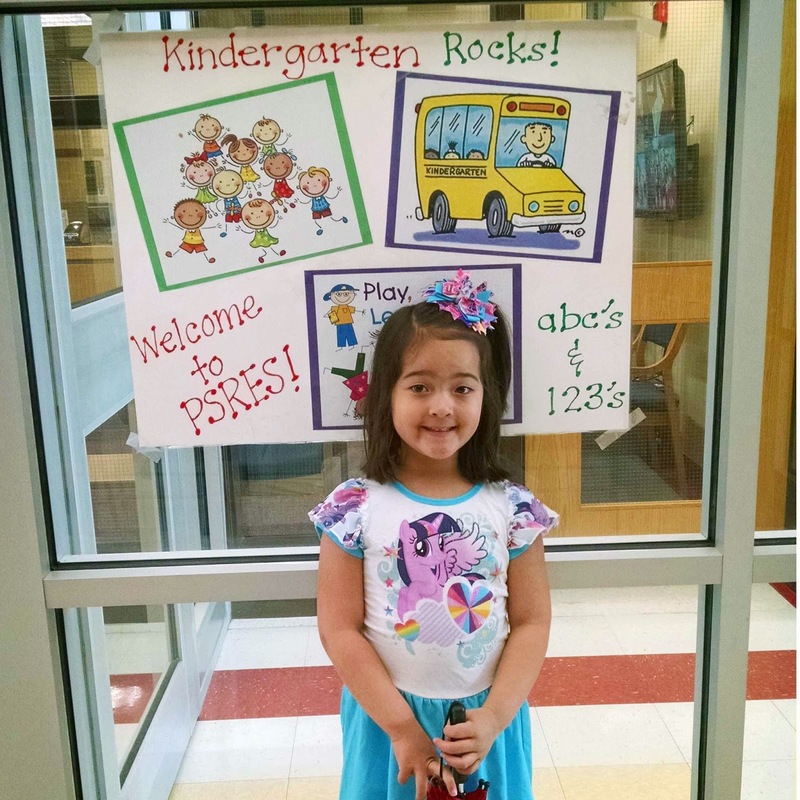 We registered Lil' Miss for Kindergarten, last week. Where, oh, where did the time go?!! I feel like just yesterday we were bringing her home from the hospital and now we are here- on the brink of something big! Kindergarten!! Yay! The newest Love Notions patterns are the Lotus Blossom Blouse- one for girls and one for ladies. That's right, folks- I sewed something for me! The last time- er, I mean the only other time- I did that was well over a year ago when I tested the Serger Pepper Sheer Plaid Top. The Love Notions Lotus Blossom Blouse was the perfect pattern for me to start doing some self-care sewing....! -The Love Notions Lotus Blossom Blouse comes in sizes girls 2t-16 and ladies XS-XXXL. -The Love Notions Lotus Blossom Blouse pdf sewing pattern will be sold individually (girls or, ladies), or as a bundle. -The Love Notions Lotus Blossom Blouse pdf pattern features no-trim pages and pattern size layers (ie, only print the size you need/want). -The Love Notions Lotus Blossom Blouse is meant to be sewn in drapey knit fabric. While it is best to sew the The Love Notions Lotus Blossom Blouse in a knit fabric that is the same on both sides (ie does not have a right side or a wrong side), the pattern does include instructions on how to seam together a front pattern piece with one-sided knit fabric. -Instructions on how to shorten/lengthen the pattern pieces are included in the tutorial of the Love Notions Lotus Blossom Blouse. -The Love Notions Lotus Blossom Blouse features dolman sleeves and twist-front accent. -The back of the The Love Notions Lotus Blossom Blouse can either be plain, or cutout (to feature a lace and/or other cool accent fabric). -The Love Notions Lotus Blossom Blouse pdf sewing pattern includes a pattern piece layout, printing chart, fabric requirement chart, size chart and cutting diagram. Links to troubleshooting, glossary, etc. are also included along the left side of the each page. Okay! Now, that we've talked about the Love Notions Lotus Blossom Blouse pattern basics, let's discuss what I sewed up! 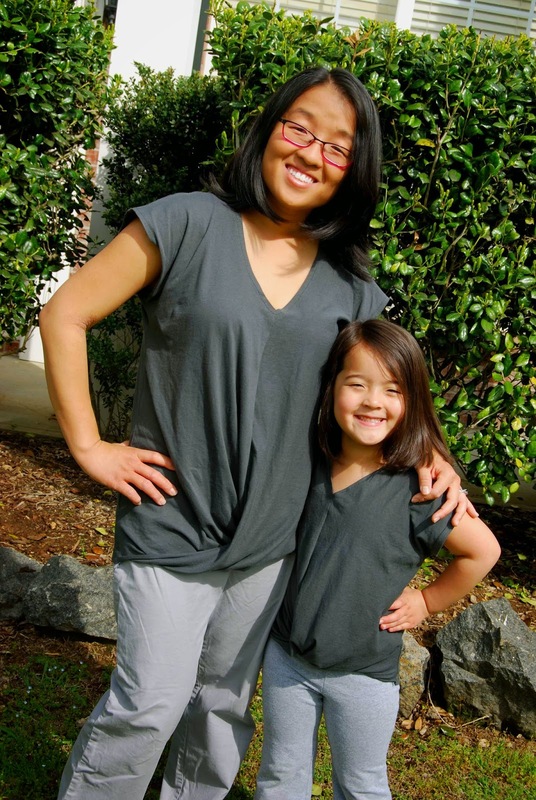 I sewed up two tops- one for me (ladies size small) and one for Lil' Miss (girls size six). I used lightweight heather grey jersey knit found at Hancock fabric. Both blouses included the cutout feature. The lace cutout was also purchased at Hancock. 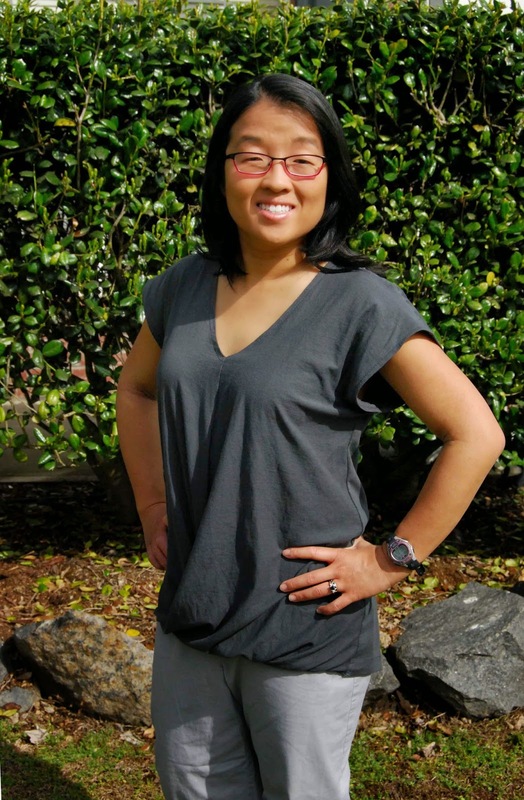 Personally,I love the flattering fit of the Love Notions Lotus Blossom Blouse! I like the slight v-neck and the back cutout. The twist in the front perfectly flatters a wide range of body types. The Love Notions Lotus Blossom Blouse is a quick sew! I sewed up the girl's one in about an hour. Cut. Serge. Topstitch and you are good to go! Really, it was that simple!! Love Notions Lotus Blossom Blouse- TWINS! From the look on her face above, I'd say that it's safe to assume the Love Notions Lotus Blossom Blouse is a winner!! Thank you, Tami, for allowing me to test these patterns for you! I had sew much fun! 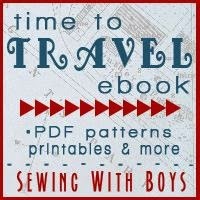 Sewing With Boys- Time to Travel Blog Tour- "Just Like Papa Briefcase" and "Ready, Set, Go Wallet"
Hello and welcome to day seven of the Sewing with Boys Blog Tour! I'm Heather and my little slice of the blogosphere is called All Things Katy! In my opinion, the "Time to Travel" e-book is mostly geared for elementary age boys and below. Now, my regular readers of All Things Katy! might be wondering why I- mother to one smart, sassy and beautiful DAUGHTER- would want to participate in a blog tour all about BOYS!?? Well, the reason is simple; I've got many, many- dare I say it- HUNDREDS! !- of pretty, cutesy, beautiful, functional, casual and fun things to sew for girls but barely anything suitable to sew for the little boys in my life (my two nephews, my daughter's male friends, birthday parties that she is invited to, etc.). The Time to Travel e-book helps to fill that void perfectly! Time to Travel, "Just Like Papa Briefcase"
First, I chose to sew up the "Just Like Papa Briefcase," designed by Amy Macdonald. 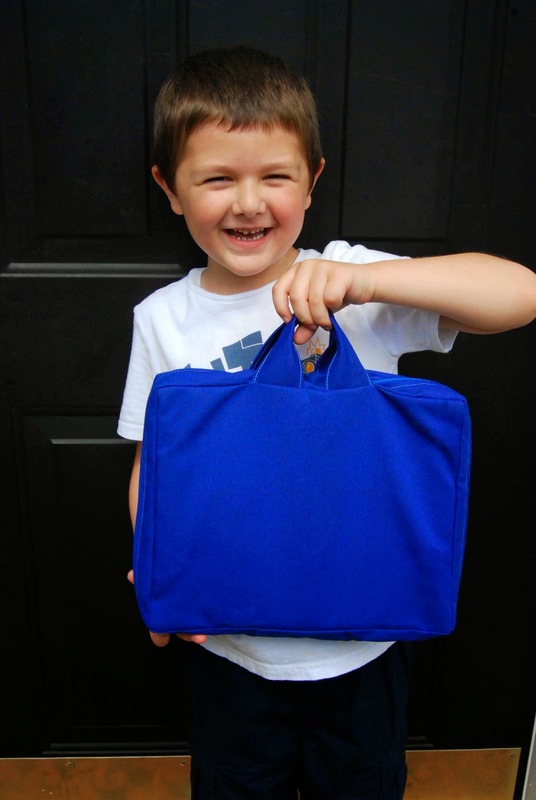 This little tote is the perfect proportion for the youngest of "businessmen" that want to be just like Daddy. The finished tote (closed) is approximately 12" wide x 9.5" high x 2" deep. 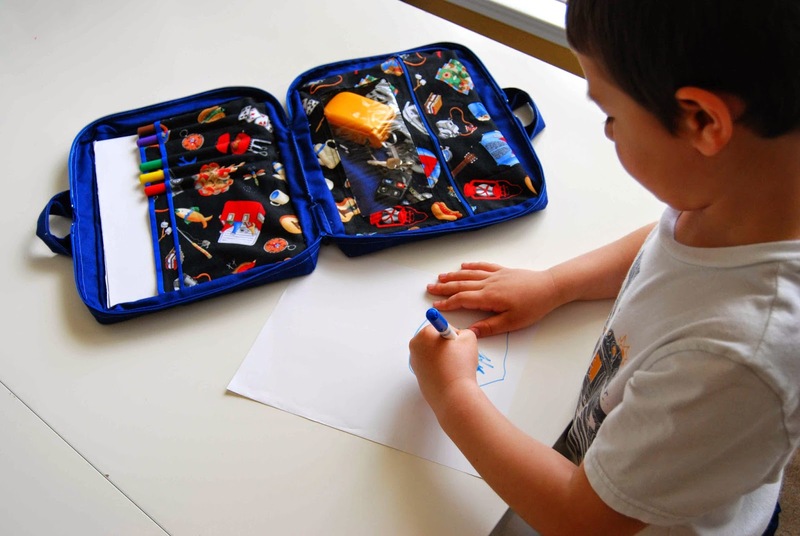 Handled, soft-sided and with zipper enclosures, this briefcase features many options The options include instructions to sew in a pencil or crayon pockets, a book pocket and an interior zippered pocket with a see-through window. 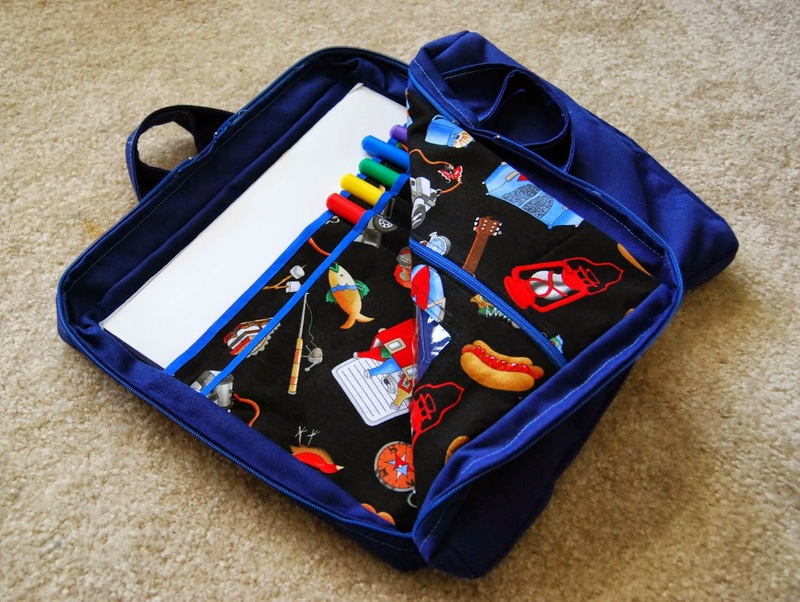 Time to Travell, "Just Like Papa Briefcase"
There is lots of room to personalize the "Just Like Papa Briefcase." 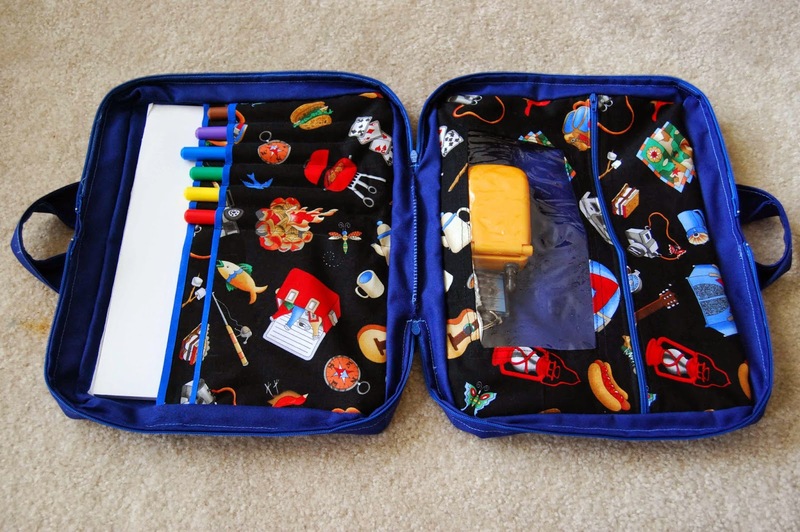 The pocket spacing can be adjusted to fit your needs and the outside of the briefcase would be perfect for embroidery! I chose to sew half a row of pocket pencils and leave the rest of the row empty to allow enough room for a small notepad. The "Just Like Papa Briefcase" is definitely an intermediate pattern. There are no step-by-step, or progress photographs (there are line drawings/illustrations for each step, however). There are a couple of finished product pictures of the "Just Like Papa Briefcase." Instructions are written out.. Overall, I was very pleased with the "Just Like Papa Briefcase." It would be perfect to bring along on road trips and my daughter has already requested one for herself. I love that the bag is completely self-contained- book, crayons, etc. can all go back in the briefcase and zipped back up for easy portability. Anything that helps cut down on clutter, hassle and keeping track of things while traveling is a bonus in my book!! Time to Travel, "Ready, Set, Go Wallet"
Next- because I couldn't stop at just one- I sewed up the "Ready, Set, Go Wallet" designed by Jonie Brooks. This little wallet took me just one short hour to sew up. Just one hour!! 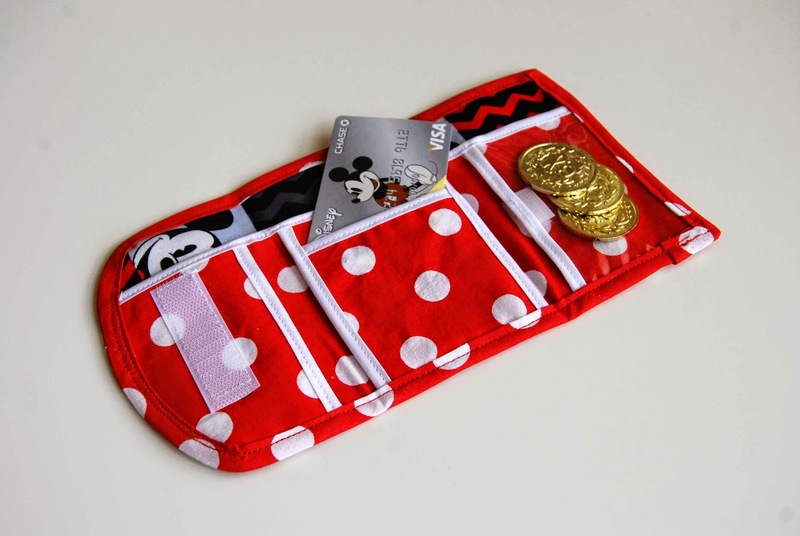 Plus, I made my own red and white polka-dot bias tape! Great, simple sew with- pun, intended- a lot of bang for your buck ;-P.
The "Ready, Set, Go Wallet" measures approximately 9.5"x 5.25" when completely unfolded. It's the perfect proportions for little hands. I went ahead and made my own red and white polka-dot bias tape because I'm crazy like that. You don't have to, though. What you do have to do, though, it make sure that you use BIAS (store bought or homemade) for that outside curve- you're gonna need it to get a nice smooth curve. I did use pre-made white bias tape for the inside trim. As a side note, I believe that the "Ready Set, Go Wallet" would be a great starting off point to teach children about money and savings. 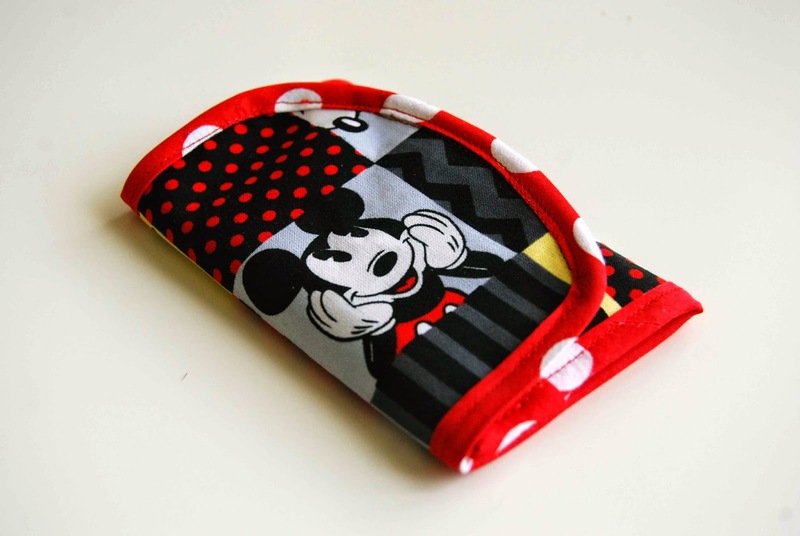 I know that my daughter would be really excited to put her hard-earned "cash" from doing chores in this wallet! I really enjoyed sewing up the "Ready, Set, Go Wallet." It was so quick and easy and turned out really nice (if I do say so, myself!). Because everything is trimmed in bias tape, there are no pockets to turn or corners to point. Simple, I like that! This would make a great gift- boy or girl- paired with a fun gift card! Connect with Sewing with Boys through their Facebook page. Purchase the "Time to Travel" e-book here. You can see more of Amy MacDonald ("Just Like Papa Briefcase") work at http://friendsstitchedtogether.com/, Jonie Brooks' work can be viewed at Knot Sew Normal. Now.... How would you like to win a copy of the Time to Travel ebook for yourself? How about some fabric, too? Participate in the giveaway below for a chance to win! But that's not all! If you buy the eBook during the tour, you'll be automatically entered to win a $30 gift certificate to Fat Quarter Shop!" Finally, please go ahead and check out these other lovely and talented bloggers as they try out the Time to Travel ebook. You won't want to miss it!! April 21: Becca at Free Notion || Heather at All Things Katy! Hello! After a brief Easter hiatus, I'm back to the sewing machine for some more PDF sewing pattern testing. Today's pattern is by one of my personal all-time favorites, the Made for Mermaids. Introducing the Grace Dress! Featuring angel wing sleeves and a super twirly skirt, the Grace Dress is the perfect addition to your daughter's spring/summer wardrobe. -The Grace Dress comes in sizes 1/2 through 14. -The Grace Dress can be sewn as a top, dress or double skirt. -Size chart, fabric requirements chart and measurement chart are all included in the Grace Dress pattern. -The Grace Dress has several sleeve options- simple (shown), double or lined. -The Grace Dress has a button up back. -The Grace Dress is all about the french seams. Directions are included within the pattern in order to achieve this technique. This means that the inside of your garment will be clean and beautiful- just like the outside! 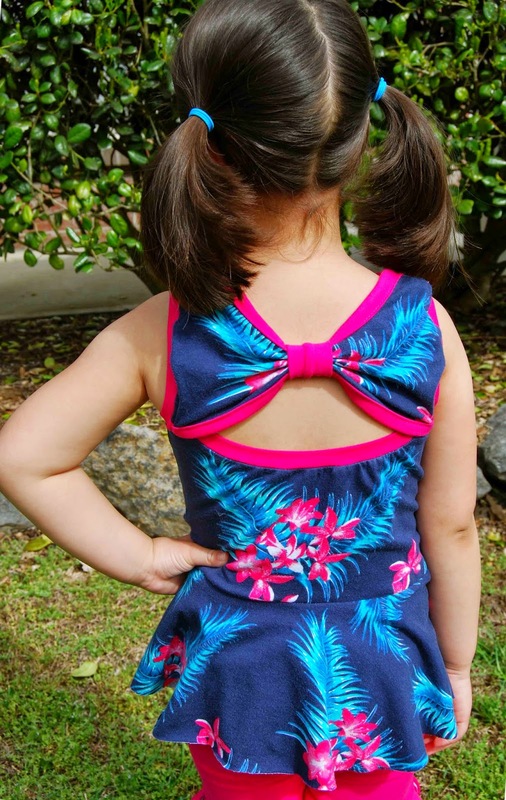 -Like most of Made for Mermaids' current patterns, the Grace Dress has no trim pattern pieces. No extra cutting- Love that! -My favorite feature of the Grace Dress pattern is the fact that it's the first Made for Mermaids pattern with size layers!! This means that with a couple clicks of the mouse, you only print the size you need. No extra ink wasted, no blurred lines to follow when taping and cutting. Just print the size you need and you're good to go! 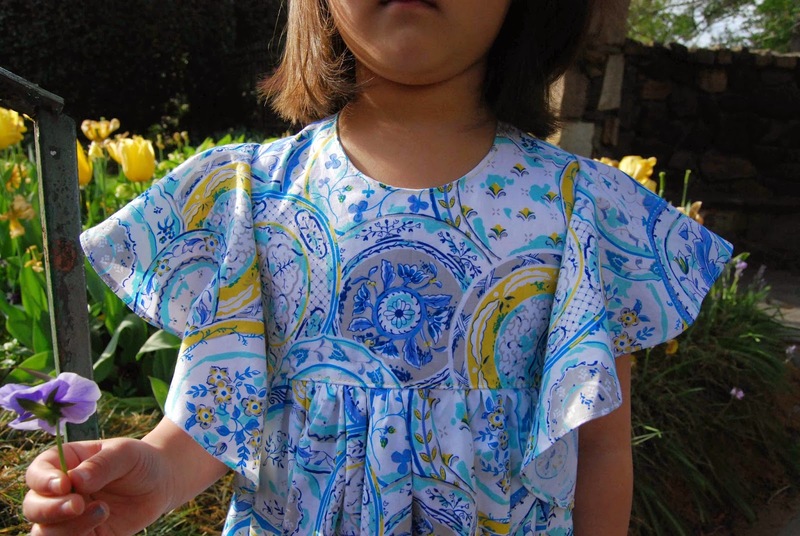 Speaking of good to go, let's get to the good stuff- the Grace Dress pattern!! I sewed up a size 6 width bodice with a size five length. Lil' Miss has recently been complaining about her shirts/dresses not having enough room when she moves around. So, even though she measures exactly for a size 5 with a 24" chest, I decided to bump up a size. I'm glad that I did! 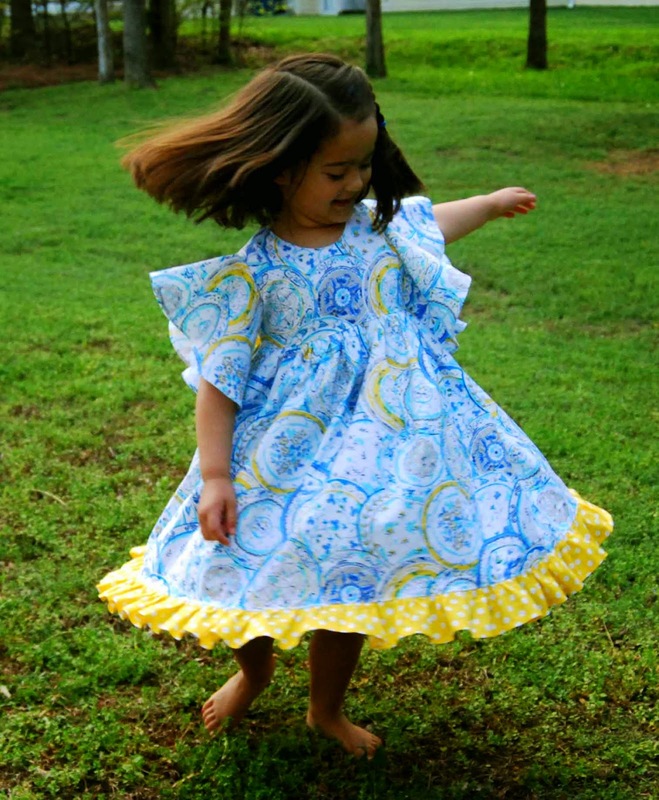 The size 6 bodice had just enough room to allow Lil' Miss to move and groove (and twirl and twirl and twirl. 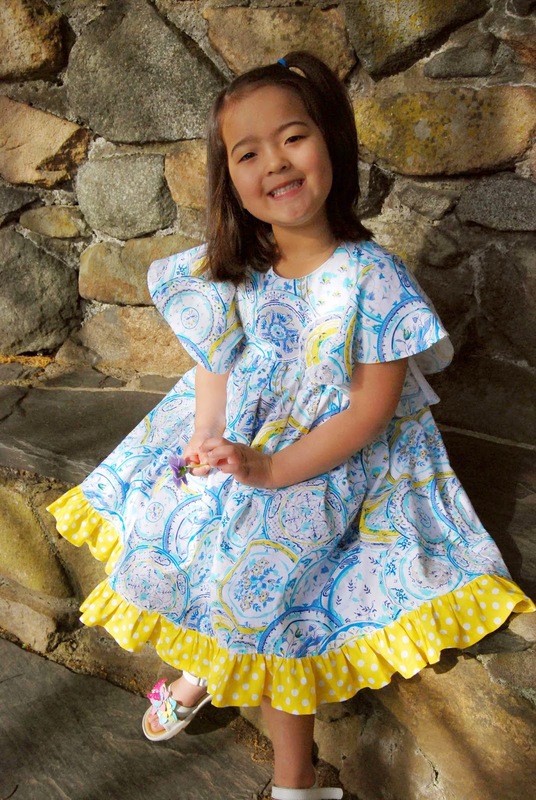 Trust me, your little one is going to want to twirl her heart out in the Grace Dress!!). I did a single skirt with hem ruffle and unlined sleeves. I used French seams at the armscyes. I used Waverly fabric from Wally world for the both the main blue and yellow accents. It's nice and sunny and bright (and, at less than $4/yard, it's a fabric bargain!!). This was my first time using the Wal-Mart Waverly fabric and I have to admit that I was pleasantly pleased with the quality. The fabric had a nice weight to it and did not fall apart during sewing (like other, cheaper fabric is prone to do). The real draw of the Grace Dress pattern are the sleeves. 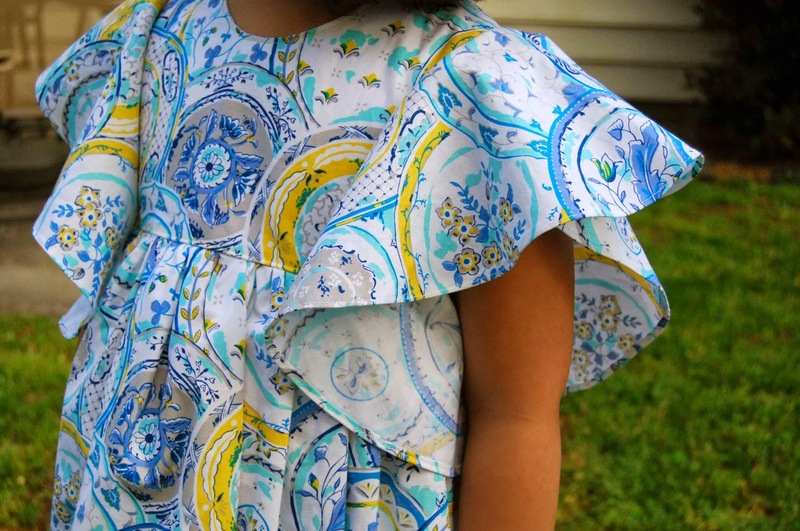 Floaty and frilly, the sleeves are meant to be sewn using light-weight material. A chiffon, lace, voile, etc. would work nicely. I would NOT use anything heavier than the quilting cotton that I used. 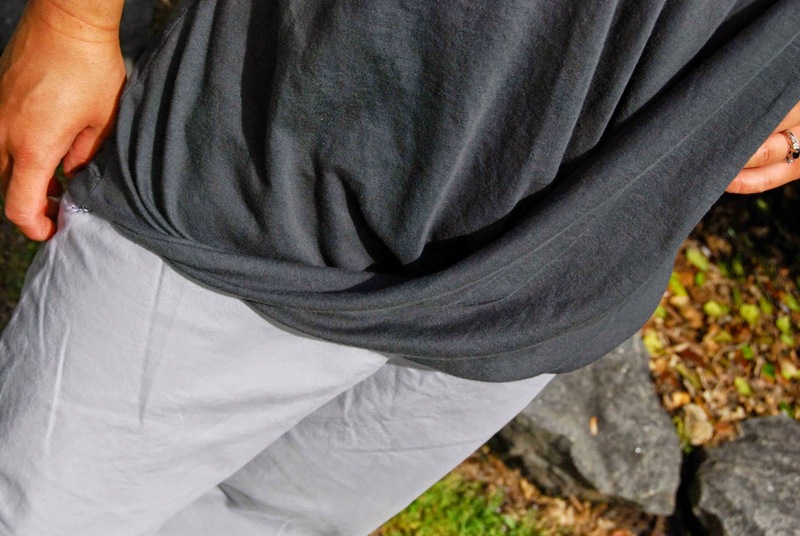 The lighter your sleeve fabric, the nicer the sleeve will lay. I really appreciate when a sewing pattern can teach me something new and/or explain another technique, better. I've used French Seams in the past, but I don't do it very often. While it can be tedious, the results are so clean and finished. Well worth the extra time! Megan definitely walks you through the steps of a French seam if that is something new to you. Studying the included pictures will definitely help a French seam newbie. Instructions are also included in the Grace Dress to create a skirt placket. This is a little "cut" finished with bias in the skirt that makes dressing (on and off) easier. I've done something similar, on my own, in the past. It's nice to see the technique put into words, though. This was a quick test, but it was so much fun! Thank you, Megan, for allowing me to once again test for you. I had sew much fun!! This morning, we were listening to Disney songs in the car, on the way to swim class. Mary Poppin's "Feed the Birds" came on. When the song came to, "...Feed the birds... tuppence a bag..." Lil' Miss asked me what a tuppence was. I explained that it was an old form of English money- something small, like a penny (my sister later informed me that it is actually the slang form of "two pence."). Katy replied, "Well, then why didn't they just SAY so?!!" That'll now be stuck in your head all day.... You're welcome.... I'm still humming it...10 hours later... HA! 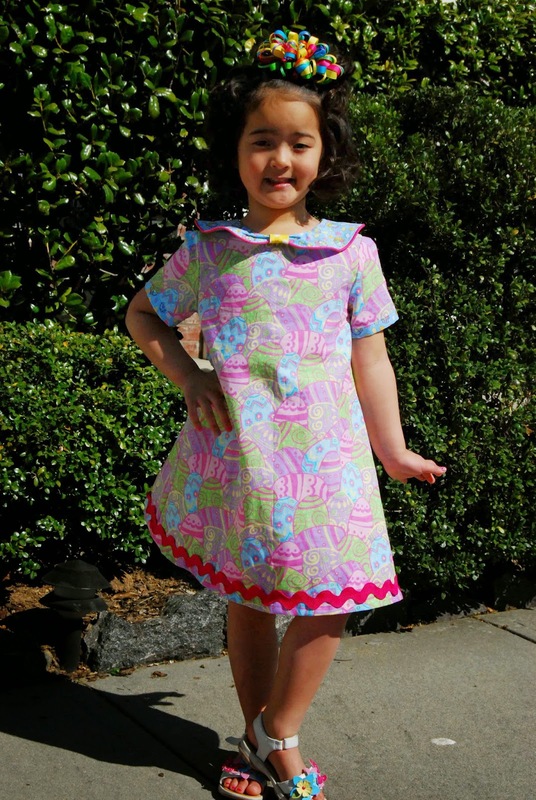 A couple of weeks ago, I looked through my PDF sewing pattern library for a new pattern to use for Lil' Miss' Easter dress. 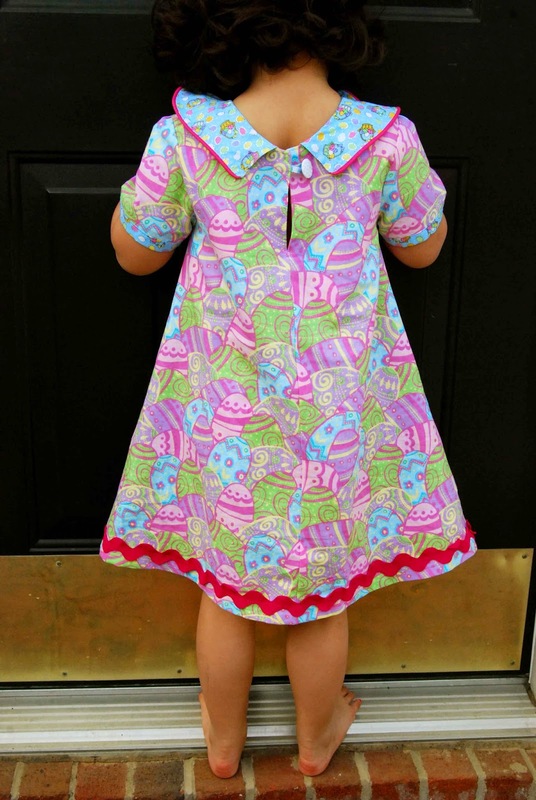 I came across Mouse House Creations the Norah Dress and Tunic. Easy, simple styling with classic lines and nothing too over-the-top... perfect for our planned casual Easter Brunch with our little family of three. 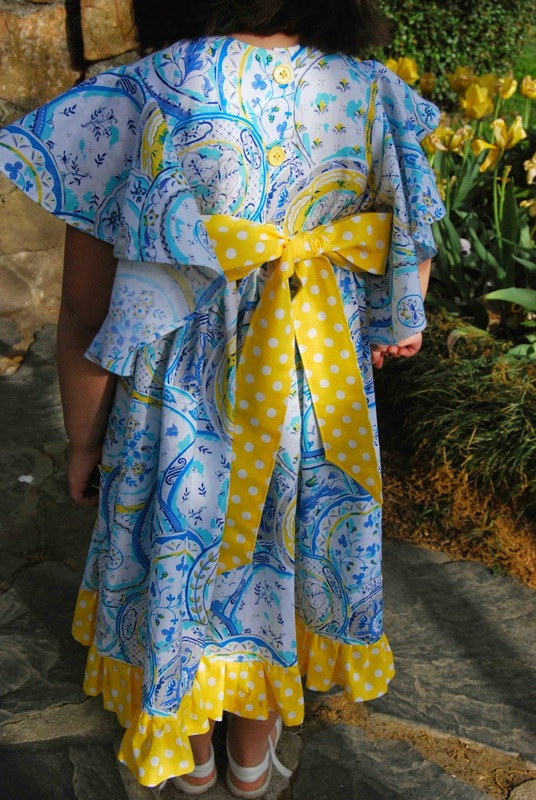 -The Norah Dress and Tunic comes in sizes 12 months-12 years. -The Norah Dress and Tunic can be sewn up in wovens are knits. -The Norah Dress and Tunic has three sleeve length- sleeveless, short sleeve and long sleeve. -The Norah Dress and Tunic can be sewn as either a dress or a tunic. -The Norah Dress and Tunic has three color options- Peter Pan, Peter Pan with faux tails, or none at all. 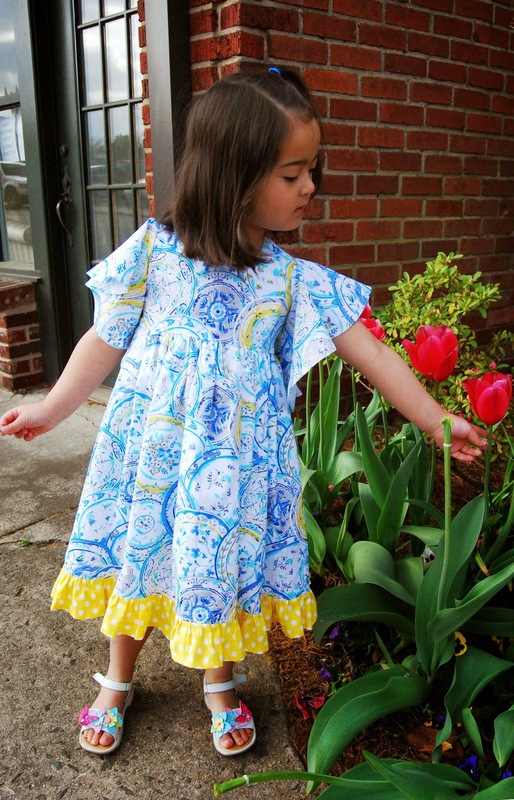 -The Norah Dress and Tunic also includes directions for how to sew in piping along the color. -The Norah Dress and Tunic is a simple A-Line dress with a single button/loop closure in the back. -The Norah Dress and Tunic PDF sewing pattern includes a yardage chart, a finished measurement chart and a size guide. -The Norah Dress and Tunic includes a glossary of terms, a fabric cutting guide and a pattern layout diagram. 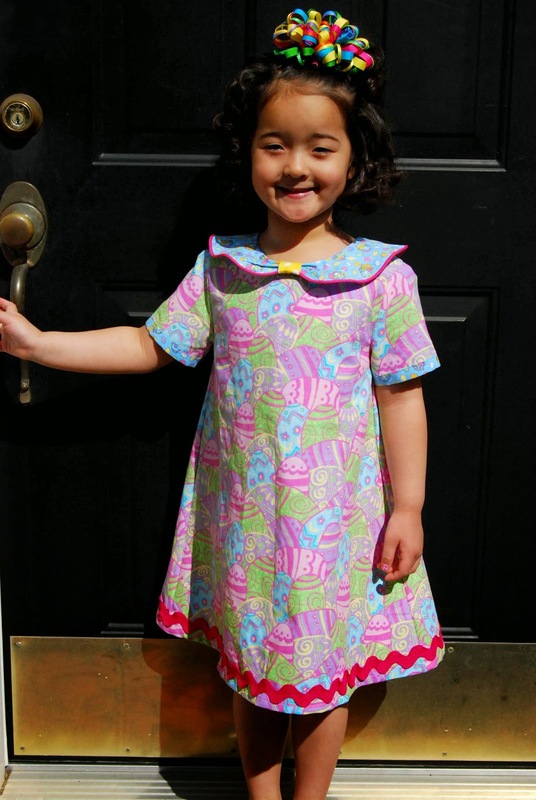 After looking at the size guide and comparing it to my model, I sewed up a size 6, dress length Norah Dress. I would HIGHLY recommend taking a moment to measure your model and compare it to the included size chart. I'm glad I did because typically, I sew a size five. However, according to the Norah Dress and Tunic measurements, I needed a size six- a size five wouldn't have given my daughter enough ease in the shoulders. 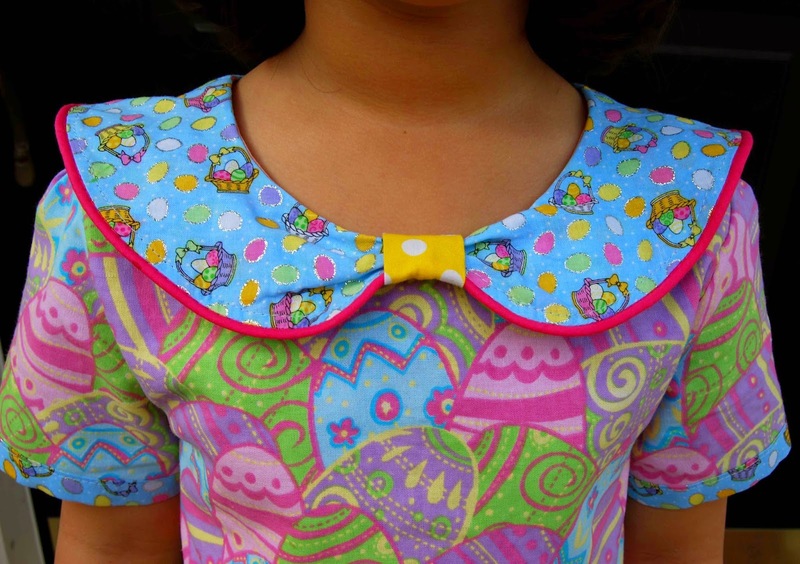 I did include the piping along the edge of the Peter Pan collar with a contrasting yellow cinch. I sewed short sleeves on my dress with my own addition of a contrast sleeve band. I used cotton woven fabric that I purchased last spring, on clearance from Hancock Fabric. The pink piping, button and yellow cincher all came from my stash. The Norah Dress and Tunic- Peter Pan Collar with Piping and Cincher. The Norah Dress and Tunic- Short sleeves with added contrast sleeve band. Cutting out this dress is a dream- everything is laid out for you in a handy fabric cutting guide. It is especially important to follow the grain of the fabric when cutting out the collar (on the bias). Sewing up the Norah Dress and Tunic is pretty simple and straightforward. There are lots of helpful pictures throughout the tutorial. Honestly, I believe I sewed this dress up in about two hours- from start to finish. I will admit, though, that I did stumble a bit at the "Sewing Up the Back Seam" section. the pictures and drawn arrows really had me baffled for a bit. However, I figure it all out and I ended up with a nice, flat back center seam with a lined bodice. I love that there are no zippers to install or button holes to create on the Norah Dress and Tunic! 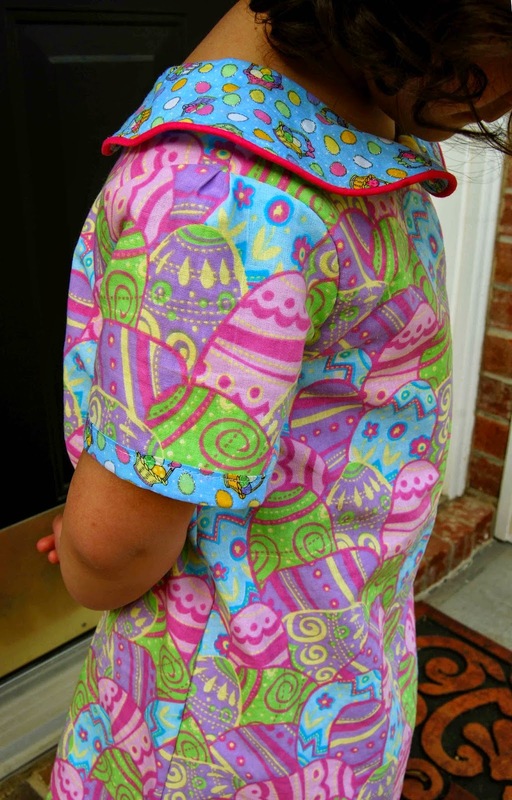 Just a simple button loop (created from fabric) and a hand-sewn button- easy peasy! There's lots of room for creativity with the Norah Dress and Tunic! Because it is an A-Line dress, the Norah Dress and Tunic would suit all different body shapes. Also, because it's an A-Line dress, there is lots of room on the front for embellishments and creativity. I added large ric-rac at the bottom hem of my dress. I was really pleased with the length of the Norah Dress and Tunic. For the size six, it falls right below the knees. Juuuust right! All in all, I'd consider the Norah Dress and Tunic a great wardrobe staple. 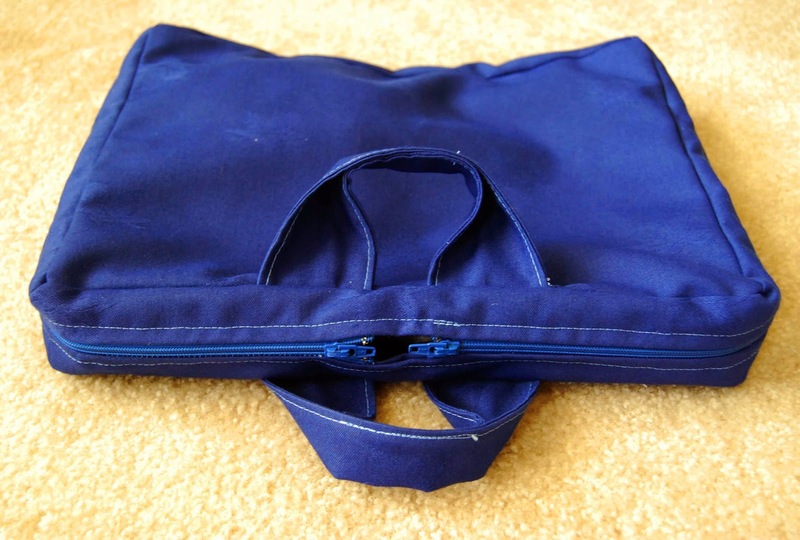 No zippers, button holes or other closures to fuss with. With the classic A-line profile, it uses minimal fabric and there are no ruffles to bother with. I had lots of fun sewing up The Norah Dress and Tunic! I'm really excited to share my latest review of Wild Blueberries with the readers of All Things Katy! Most times, I am asked to review products and prepackaged things. However, this time I was asked to review frozen wild blueberries. Healthy, packed with antioxidants and a versatile flavor in foods- I mean, what's NOT to love about Wild Blueberries??!?!?!? "Founded in 1981, the Wild Blueberries Association of North America (WBANA) is a trade association of growers and processors of Wild Blueberries from Maine and Canada that is dedicated to bringing the Wild Blueberries health story and unique wild advantages to consumers and the trade worldwide. To demonstrate their dedication to furthering research that explores the health potential of Wild Blueberries, WBANA has hosted the Health Research Summit in Bar Harbor, Maine since 1997, which is a worldwide gathering of scientists and researchers whose work is leading the way in understanding the health benefits of Wild Blueberries." • Wild Blueberries are wildly different from the regular blueberries you normally find in the produce section. Don’t be fooled by their size—they pack more into their tiny blue bodies than any other blueberry on the planet! • Wild Blueberries have a more intense flavor than regular blueberries. Wild Blueberry plants are more genetically diverse with thousands of interlocking plants spreading and interlocking naturally across fields over thousands of years. That diversity is what gives Wild Blueberries their complex and delicious flavor—an extraordinary mix of tart and sweet. • Wild Blueberries have two times the antioxidant capacity of the larger cultivated blueberries. A growing body of research shows the potential health benefits of Wild Blueberries including gut health, diabetes, cancer, and brain health. • 99% of the Wild Blueberry crop is frozen fresh at harvest, which locks in their nutrition and taste. • Wild Blueberries are called “Wild” because they are not planted— they have occurred naturally in barrens and fields in Maine and Eastern Canada for 10,000 years. • The retail price for a 15-ounce bag of frozen Wild Blueberries starts at $3.59. A 3-pound bag retails for about $10. 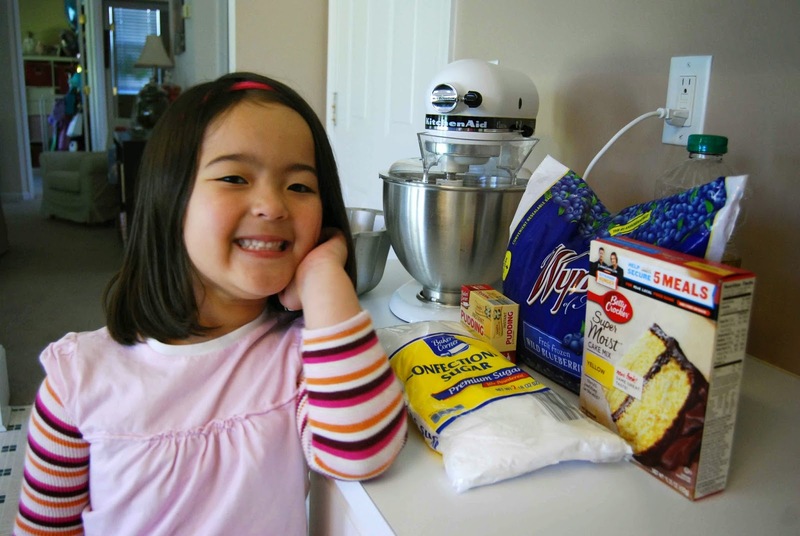 Lil' Miss loves to be my assistant in the kitchen! -Mix cake, oil, eggs, cream cheese and pudding on medium speed. Mixture will be very thick! -Fold in frozen Wild Blueberries. Lil' Miss carefully folded the frozen Wild Blueberries into our cake batter. 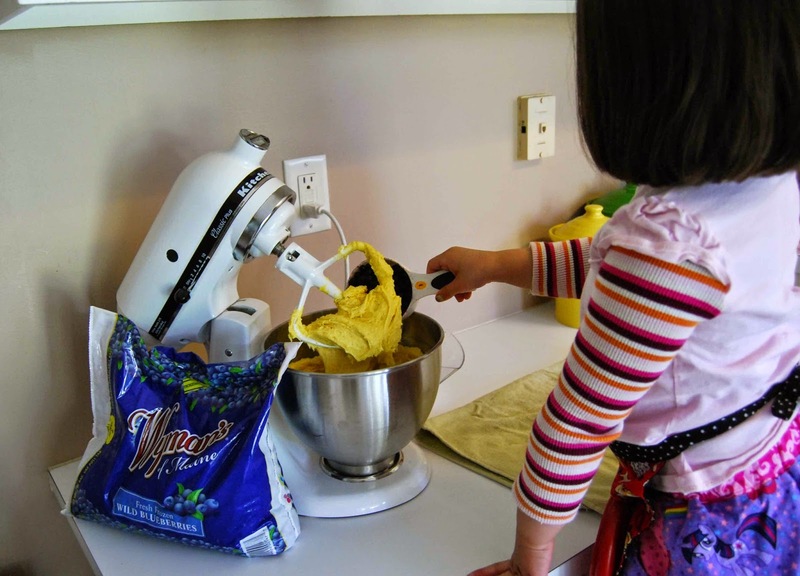 -Pour batter into prepared bundt pan and level off top. -Bake at 350 degrees for 45 minutes, or until tester comes out clean. Look at that beautiful purple, blueberry goodness! No fake dye here! 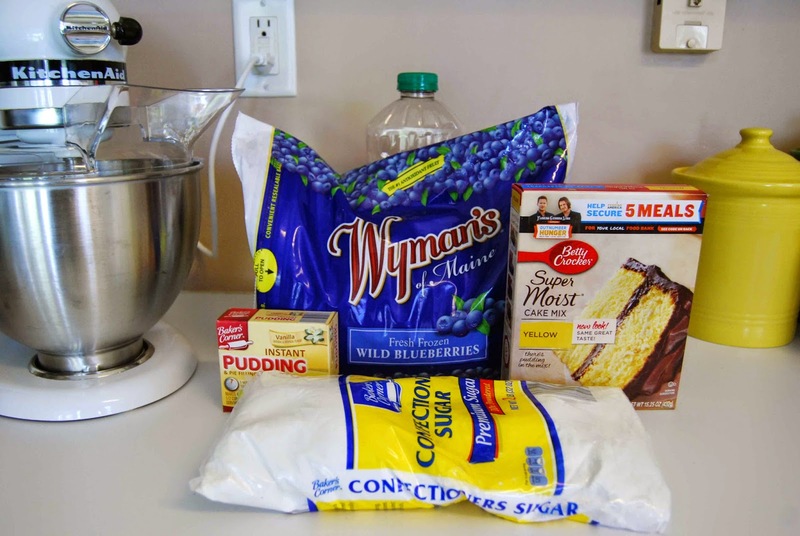 -While the cake is baking, mix the powdered sugar and Wild Blueberries juice together to create a smooth icing. 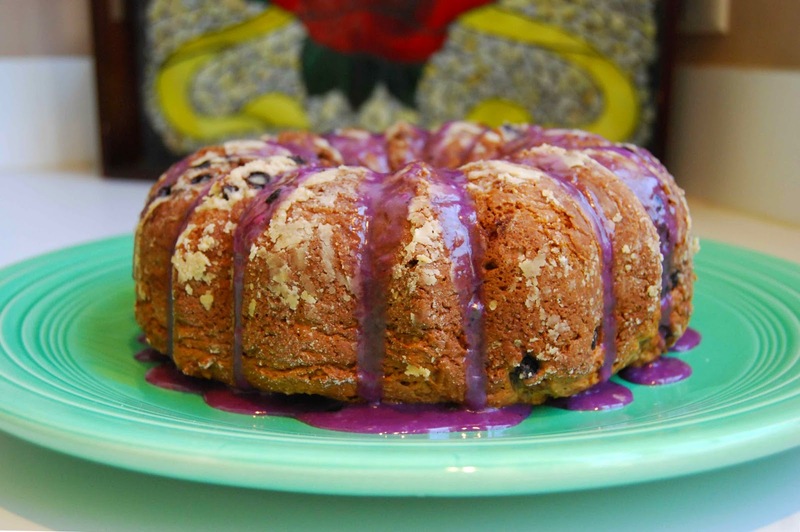 Drizzle onto bundt cake while hot. 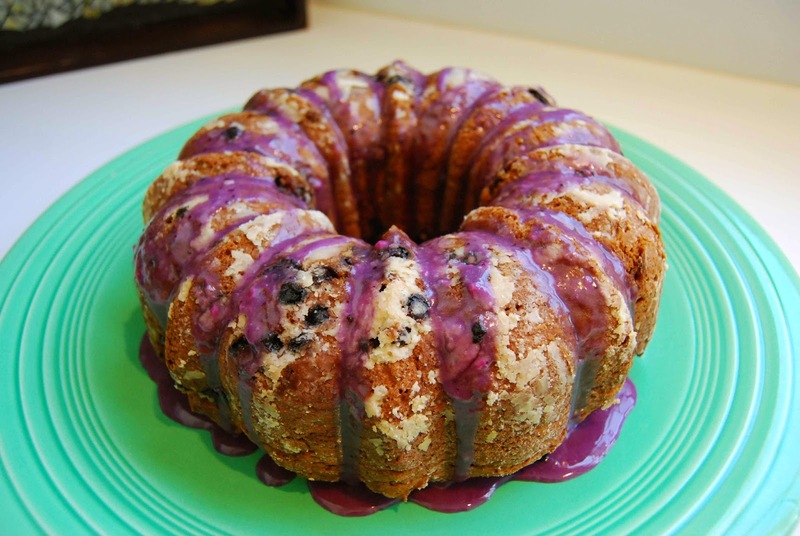 -Grab a napkin, dig in and enjoy that beautiful Wild Blueberries Bundt Cake! Yum, yum, YUMMY!! "Caught ya!" 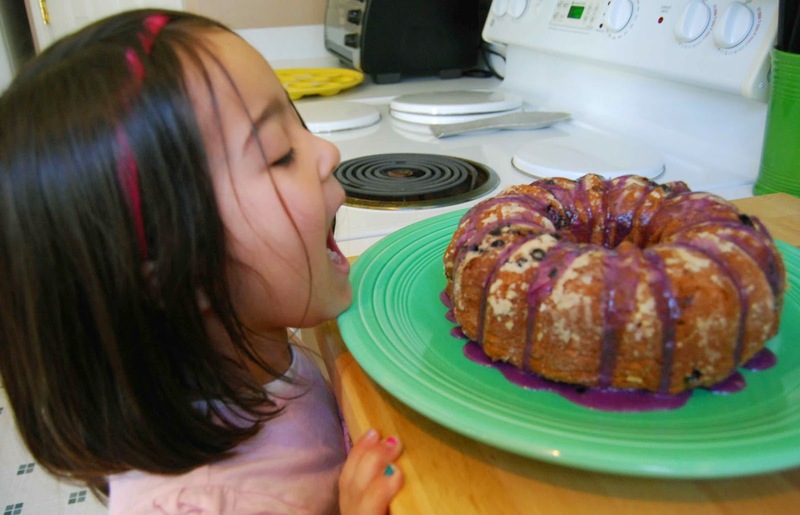 Lil' Miss couldn't wait to dig right into the Wild Blueberries Bundt Cake! 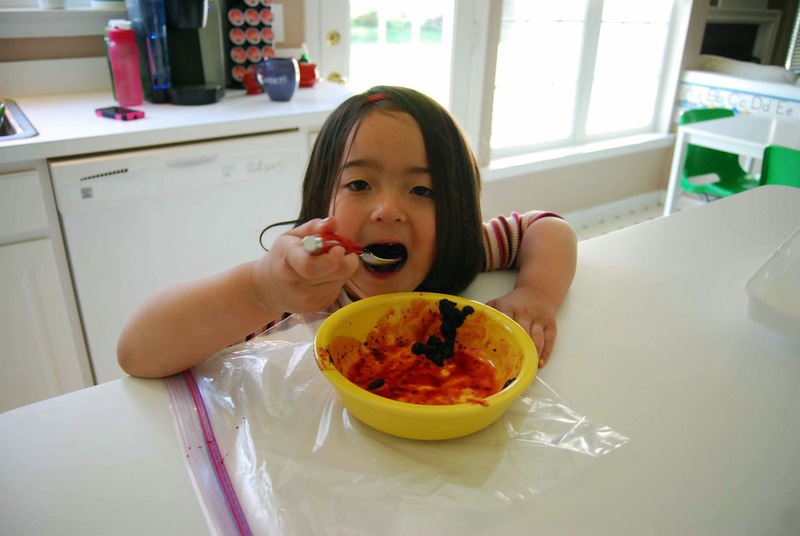 In the end, Lil' Miss couldn't help herself and she helped herself to a big bowl of frozen Wild Blueberries, straight up! The perfect anytime snack! !